If you’ve played any of the other games in The Resistance lineup, you will probably already know that the latest installment, Coup, has at least something to do with deception. You would be correct in that assumption, but the manner in which Coup differs is that deception isn’t mandatory. Coup very successfully turns this template upside down (or at least stirs it up), allowing anyone to play a successful game by telling the truth. Quite simply there just isn’t a “You are the ‘Bad Guy’” card. Now it’s doubtful the tactic of being 100-percent honest would be an infallible strategy, but the virtuous among us need not worry about drawing a card that triggers heart palpitations, twitches and beads of sweat. Paradoxically, despite being able to approach this game honestly, Coup somehow manages to dangle the temptation to deceive even more than the games preceding it. That little cylon voice inside your head will likely tell you that you can get away with it. Over and over again! It just will not go away!! Okay, maybe that’s just me. 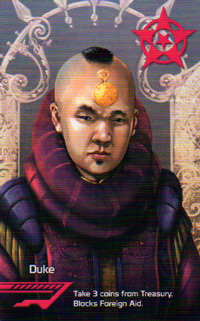 In Coup you are dealt two cards from a deck 15. On each appears a character. There are three of each character type in the deck, for a total of five different characters. The game refers to these character cards as your “influence.” This means it is possible to be dealt two cards of the same type. You will keep these cards hidden. 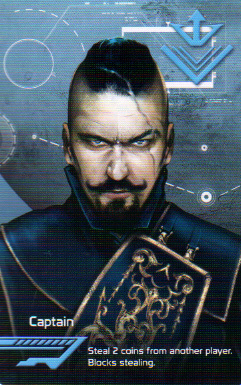 By taking an action on your turn, you are announcing to the other players (up to six others, in fact) that you very truly — cross-my-mechanical-heart-hope-to-die — possess the character card conferring the action you’ve announced. Maybe you have the card; maybe you don’t. If everyone is cool with you taking that free action, you either just got away with murder (and murder is an action), or it’s just another day of honest political maneuverings in the not-too-distant future. Play proceeds clockwise. There are three other actions you can take on a turn, regardless of the personalities you have in-hand, making a total of seven actions you can take. What are these actions? If you’re the Duke, you can Tax — take three coins from the pot. If you’re the Assassin, you can kill off a face-down character card at a cost of three coins. If you are the Ambassador, you can exchange cards with the draw pile if you desire a different character. If you are the Captain, you can steal two coins from another player. And finally, if you are Contessa, you possess the counteraction that allows you to block an assassination attempt against you. You’re Not Going To Take It Anymore! There’s yet another layer of intrigue to this game — all but one of the above-mentioned influence personalities also have counter-actions, which you can choose to use any time. And just like taking actions, you may or may not actually have the influence in-hand you are claiming. There is plenty here for fans of deception and political intrigue. 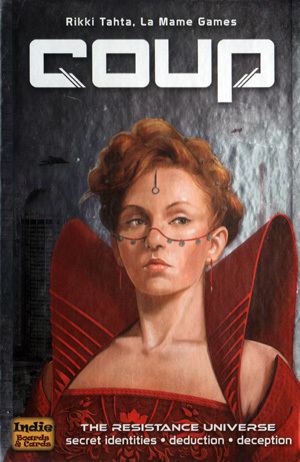 The concepts in Coup are simple, and this is very much a social game. Like The Resistance games before it, Coup is most elevated when playing with people who can take the heat. Your inherent duplicity is appreciated. It’s also a game for gamers who simply enjoy watching the always entertaining and unexpected interplay unfolding across the table. Finally, it makes for a good game to play while drinking. (But of course it does!) I found that by the third game, I was accusing pretty much everyone around the table of trying to deceive us all. I mean, one should stand up for what’s good, morale and just, shouldn’t he?! I issued some officially-sanctioned in-game challenges with exasperated cries for help, “Doesn’t anyone else care these people are lying? Do I have to take care of everything myself?” This fell on deaf ears. It turned out they weren’t lying. My two influence cards were the first to flip over. Thanks for the kind words, Tam! Ha! Thanks! I appreciate it.